Actor Vishal is upbeat over his Theeratha Vilayattu Pillai, which is due to be released in a couple of days. The actor, in an interview earlier, had said that he would not star in a film that has three heroines again. When questioned about this, Vishal agreed that he had indeed decided not to act in films with three heroines. Elaborating further, he said that the reason is unexplainable and refused to go into it. Vishal is happy that Sun Pictures is promoting the film. 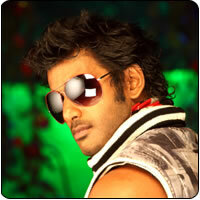 Vishal is sporting a new look in this film, which is touted to be a romantic flick. However, the actor states that there are some action sequences too satisfy his fans.